Two of the most fun parts about the holiday season are gifts and dorm room decorating. The holiday season is a fun time that allows you to spoil your friends and family and show them you care and you can also make your college dorm room decor a fun holiday wonderland that is sure to impress your friends and family. When you're adding dorm essentials to your college dorm checklist for the holiday season, there are a lot of dorm items to think about. You need to add your dorm Christmas tree along with dorm room decorations for the branches and you also need to think of all the gifts you're going to get for your friends and family. With so many dorm necessities on your holiday college dorm checklist, it can be easy to forget about a dorm essentials item here or there. When you're thinking of your dorm room decor for the whole college year, you know that versatile dorm items are great and you can get more than one use from them. 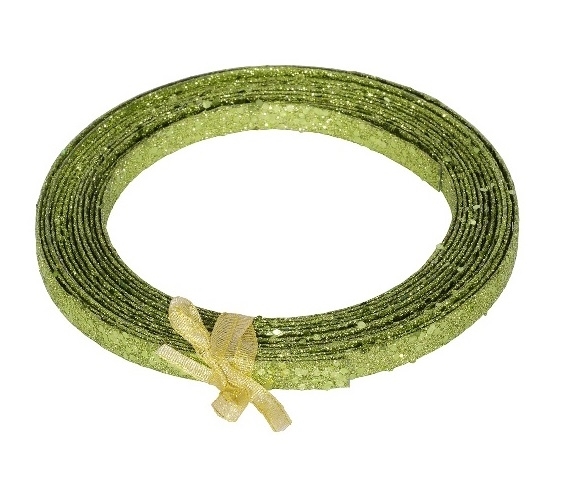 You can have the same idea for your holiday dorm room decorations with dorm items like our 23' Lime Green Glitter Ribbon! This dorm essentials item can be used as a pretty accent on a gift to your best friend and it can also be used as an accent piece in your dorm room decor! Our Lime Green Glitter Ribbon is a thicker and sturdier ribbon than most, allowing you versatility with your college supplies. Wrap this dorm item around your dorm Christmas tree, college bookcase, and even your dorm room door for extra holiday dorm room decor!